"My It's Been A Long Time!!!" 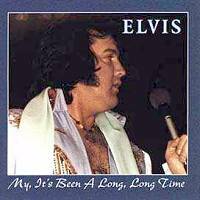 Yes it has been a long time since Elvis gave such a good concert during 1976. The year 1976 was not very good for the king, suffering from health and personal problems; it was very hard to take out the best during this time. Going thru concerts from that year, you can hear that his voice is somewhat "whining", as long as the shows went on. You will hear more of the orchestra and musician among him and less of his voice. "Old Times They Are Not Forgotten", "One Helluva Night" and "Chicago Beat", are sad, but good examples of the total Elvis sound quality and mood of that year. In some concerts it seems that Elvis was forced to perform, doing it without the Elvis Presley magic is as good as not doing it at all!!! "My It's Been A Long Time Is" a refreshing concert, Elvis sounds great, full with power and energy, the overall sound quality is very good, the balance between the orchestra, the musicians, and Elvis is well kept. He is in a very good mood, he laughs, no long boring talk about nothing, just 100% show. The show start with a nice surprise; The Sweet Inspirations warm up show. Although it has been taken from another concert it is a great way to start the show. You imagine yourself sitting in the front row watching them. Then the lights go out and you hear the "Also Sprach Zarathustra" opening theme at full blast. It's time for the King!!! We get to hear all the familiar songs (why didn't you perform 'Polk Salad Annie'?). All the songs are performed very good, and with the right tempo. Performing songs like: 'America', 'Hurt' and 'You Gave Me A Mountain' show you that his voice was strong and deep in the best way for the concert (unlike other concerts from 1976). 'Early Morning Rain' and 'And I Love You So' are performed softly and almost make you cry. To my opinion a song like 'Hound Dog' shouldn't be at the end of the show just before 'Cant Help Falling In Love', it doesn't give the concert the smooth end you would like to hear. 'Hurt' would have been a better choice. This is a great concert. It has a good atmosphere, it is Elvis at his best and the sound quality is very good. "A Hot Winter Night In Dallas" is the only concert in 1976 that can match up with this show. The artwork is great!!! It contains pictures from the actual show.